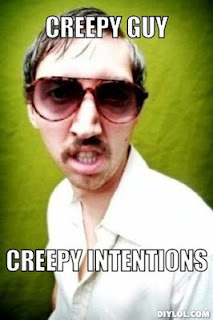 The truth be told I am a creeper magnet. 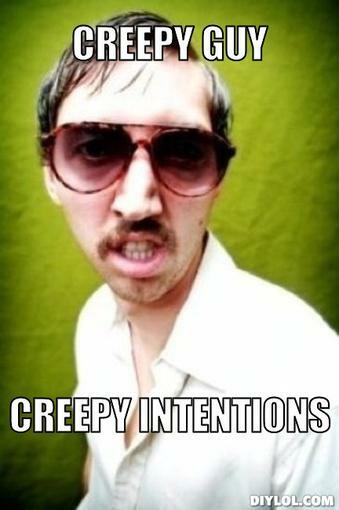 I have many stories about creepers and they get really creepy. Ask me to tell you one sometime, I have many to choose from. I think I am a rather normal girl but if there is a creeper in the room he will find me and talk to me. I guarantee it. One night last week I ended a full day’s work to pick up Marvin from Inside Out so I could go for an hour’s spin on the booty loop. I was having an enjoyable ride from the shop, through town and down East Boulevard (who doesn't love East Boulevard?). I waited for the light at Queens Road West and after it turned green I cruised onto the loop. Those of you familiar with this intersection know I was going at a significantly slower speed than the cyclists already on the loop who get to careen at a high rate of speed through the right turn thanks to a lengthy and uninterrupted downhill. So it was not surprising when two dudes passed me somewhere between that intersection and the turn on to Hopedale. The guy leading the pair turned to me with a smile and a hello but continued on his way . . . or so I thought. He was rather nondescript except for a little extra in the middle and his obnoxiously bright yellow Mavic cycling shoes. I do not know if he slowed down or if his companion decided he did not need his draft anymore but the next thing I know the one guy is off the front and Mr.Mavic has made his way behind me. This sequence of events is not unusual so I continued to enjoy my ride at a steady but easy pace. I figure he will ride behind me through the flats and then pass me in a turn or on the first hill like most dudes do. There are two types on guys on the booty loop – those schmucks who go over their ability to pass a girl just because she is a girl only to fizzle out a quarter of a mile later and the guy who turns to me on every hill asking why I am pedaling so hard and demanding to know my 3 sec watts (he has a blog and it is here). Anyhoots, so Mr. Mavic pulls in behind me and never leaves. I go fast, I go slow, I accelerate through the turns, I inch through the turns, I pass people, people pass me, no matter what I do the Mr. Mavic just hangs back there. At times he is just coasting and I can hear is rear wheel free spin. I can practically hear him breathing in my ear. I eventually caught up to Mr. Mavic’s original companion hoping the reunion would remove the growth from my back wheel but it didn’t work. Finally I pulled into the parking lot when there were a large number of people getting off their bikes. Mr. Mavic also pulled into the parking lot. I stopped, pretended I knew someone, and watched as Mr. Mavic circled the lot and headed out. I gave him a good head start before I headed back to the store. That is creepy right? Freakin creepers.